In August this year, Mastodon’s Brann Dailor reported that the band were gathering ideas for the follow-up to 2017’s Emperor Of Sand. Along with tagging Kelliher, he also mentioned Brent Hinds, so it would appear not everyone is currently involved in the process... but it’s good to know that work is starting on fresh sounds. 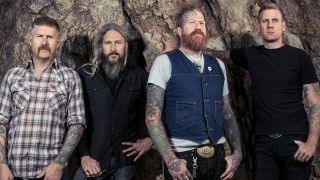 Mastodon will leave the studio early in the new year to head out on the road across the UK, Ireland and Europe for 25 dates. They’ll be joined by special guests Kvelertak and Mutoid Man, while Scott Kelly from Neurosis will hook up with the tour through February 9 on Brussels. Promoters for each show will also make a donation to three charities: The TJ Martel Foundation, Hirshberg Foundation For Pancreatic Cancer Research and the Pancreatic Cancer Action Network in light of Mastodon’s manager Nick John’s death earlier this year from pancreatic cancer.